Wieke van Schuilenburg Model Pref. 4 year old Friesian stallion by Gerben 479 Sport and Fridse 423 Sport on the mother's side. Ype is a long legged sport type with an excellent character, superb ground manners, and has been well traveled. Upon meeting him, he is kind and affectionate but respectful. He does not behave like a stallion. Stands perfectly well when being groomed and does not mind an audience. As only the second person to ever ride him (other than the trainer) he was cautious, but responsive and warmed up to me quickly. Ype uses his back in the correct way and has very comfortable and fluid gaites. Received a 1st premie from the KFPS as a foal. He was a nice elastic walk and an active-ground covering canter that will make for great upper-level work when the time comes. 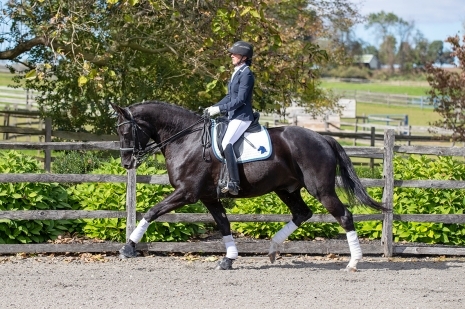 Ype is a horse with a future in the competitive dressage arena. Can be gelded before transport.